This weekend, I was lucky to be part of the very first US cohort of Picademy. My Pi journey has been relatively short so far. I only got into using Pi after watching students work with one for their 20 Time project. Heading into the event in Mountain View, I wasn't sure what to expect. Was I going to flat out embarrass myself with my overall lack of knowledge in front of all these Pi experts? Was I going to end up in a ball crying myself to sleep because I'm so far behind. I just didn't know what was ahead of me. Well, I have to say that Picademy has been one of my best overall PD experiences. It is without a question amazing. Here are some of the highlights. I was lucky to know some of the people that attended Picademy. Some were part of my GCTMTV14 cohort. It was nice to connect with them and share stories on how things have been going since we left Mountain View 1.5 years ago. There were others that I knew through Twitter, ISTE, and other conferences. There were also friends I had not even met yet! We were all there to learn about Pi and we all had different skill levels and we were all there support one another. I do not think I have ever felt as well supported at a workshop/event than I did at Picademy. The Pi experts managed to strike an amazing balance of letting you fail, helping you a bit, letting you fail, and guiding you to the correct answer while they walked you through WHY it was the correct answer. This is something I still struggle with in my classroom and this crew did it easily and did it with style. There were times when attendees would be able to help one another as well. I would be able to help someone with some Python code and someone would help me with the Twitter API. We brainstormed ideas together and encouraged each other as we tried to push our limits of understanding. It was such a great atmosphere of support that really made failing very easy and comfortable to do as we learned. In all honesty, Picademy spent the first day working on the skills that we would need to create our Hacking project the next day. It was a very nice and easy transition from learning to applying. It's not surprising since so many of the Pi experts were former teachers. They understand the learning process and were able to impart skills to us and then support us as we struggled to implement those skills. Yes, PBL at Picademy! We did not just sit and watch slides, we had our Pi kits and were given tools to use to make it happen. We watched and then we applied what we learned to the project in front of us. We then took our new found skills and applied them to a project that was meaningful to us. You found partners to work in groups to work on projects that you were both passionate about. It was awesome! I felt like part of a much larger community that embraces the hacking and creative lifestyle that I want to impart to my students. Raspberry Pi folks are dedicated to creating and sharing. The Raspberry Pi Foundation is about using technology to balance the playing field for all people in the world and they think their credit card sized computer can do that and I have to agree with them. Raspberry Pi allows anyone access to a simple computer that can help you master coding skills that can advance you in life. The community around Pi is incredible and I feel very lucky to be part of it. Raspberry Pi encourages Pi enthusiasts to get together and share their love of all things Pi. In this spirit, people get together and host Raspberry Jams. A handful of us from this Picademy Cohort are already working with people to bring a Raspberry Jam to ISTE this Summer. No idea on how we are going to do this, but we really want others to connect and share their ideas regarding Pi in classroom and ISTE is a great place to do this. Raspberry Pi Academy was an amazing experience and I want to encourage everyone to get out there and get their hands into Pi and see what you can create and then take that experience and share it with your students. If you want to attend the next Picademy USA, check out the link and submit your application so you can get a cool certificate and pin like these. To Kill a Mockingbird was never a book I appreciate or understood in high school. Hell, I'm not sure how much I truly understood it when I started to teach it for the first time. It took they eyes of children, eyes much like Scout's, to truly show me what TKAM was all about. Harper Lee passed away today and she left us one of the most important novels in American Literature. The voice of Scout is a narration authors can only hope to capture in their novels since TKAM was released. To me, Atticus stands the test of time as a figure doing his best to leave a better world for his children. His words of wisdom still ring true today. Harper Lee crafted a tale that spoke on race, poverty, education, societal norms, and so much more. It is a book that is powerful and has the ability to, not only remind people of the way this country used to be, but the way the country still is in many ways. For this, I say Thank You Harper Lee. You left us a gift that will continue to matter for years to come. When Is It OK To Hit Your Students? I would like to say never, but there are schools in this country that practice corporal punishment and it makes me sick. I honestly have a knot in my stomach the more I think about it. School is supposed to be a safe place. It is a place to make mistakes and hopefully have someone kind and compassionate guide you to better decisions next time. For some students, school might be the only safe place they have all day. To steal that from students by issuing corporal punishment is disgusting. This article in the Washington Post by Christopher Ingrhaam, "The states where teachers still beat kids" provides some great information on where corporal punishment is legal and which states keep track of when and on who it is used. Some might argue that it is not very widespread and does not happen that often. Tell that to the student asked to bend over and is spanked. One child that is hit is an institution for learning is too many. I often wonder about the educators that issue/administer corporal punishment. Are they just part of the system and are too afraid to speak up about it? Do they believe, despite the fact that, "Many studies have shown that physical punishment — including spanking, hitting and other means of causing pain — can lead to increased aggression, antisocial behavior, physical injury and mental health problems for children," the American Psychological Association wrote in 2012", that corporal punishment works? The UN and the American Academy of Pediatrics both oppose the practice, but what do they know? Do some educators simply believe that kids deserve it? Anyone that was ever hit growing up, knows that feeling. The feeling of embarrassment and shame. The anger lingers long after you have been hit. The tears shed as you look at someone that is supposed to care for you as you are hit. No educator should ever give those feelings to a student. I do not see how any educators that claims to love children can also be part of hitting them as part of their job. It makes no sense to me. There are cultural aspects that are in play in corporal punishment. For some communities, spankings, hitting, whoopings, etc are just part of discipline. It breaks my heart to think that is where the conversation ends for some people. "It's just what we have always done" is a terrible way to argue in defense of hitting a child. I try and think of the different reasons one might have to validate hitting a child as a form of punishment. Bullying? Cheating? Tardiness? How about fighting? I'm sure kids are paddled for fights. I imagine it goes something like this. Principal - "Billy, hitting another classmate is never appropriate. You have to learn to settle your differences in a more constructive manner. I want you to think about this as I take this paddle and strike you 5 times in the backside." There are plenty of things in education that have evolved over time. Making students do homework as a punishment connects learning as something bad. I do not see this practice anymore and I used to get this as a punishment in school. We are taught not to publicly shame our students in class. We should handle discipline privately with the students. Can you imagine making a student sit in the corner with a Dunce cap on? The backlash from the Internet would be insane! Yet, we seem to ok with educators hitting students. We need to move away from archaic practices and focus on what is best for our students. As educators, it has to be our job to stop these types of things from going on in our schools. It is up to us to ensure that our students know they are coming to a safe place. The students need to know that we are not going to hurt them. If we cannot offer the protection these children need, who will? "Black students are twice as likely to be struck as white students in North Carolina and Georgia, 70 percent more likely in Mississippi, 40 percent more likely in Louisiana, and 40 percent more likely in Arkansas." These numbers come from the Department of Education Office of Civil Rights and they are not good. Sadly, I wonder if these numbers are too low. How many schools are not accurately reporting the number of times students are being disciplined? Corporal punishment seems to be something that schools do, they know it is not really the best thing so they keep it sort of quiet, but keep doing it because that's what they do. It does not stop with corporal punishment either. Black students are more likely to be suspended than white students. In Michigan, if is a student is suspended, there is a very likely chance that they are black. I will do another post on the out of school separations and the fact they accomplish very little most of the time, but these numbers are a problem. Again, it has to fall to educators to solve this problem. We cannot wait for legislators to come in and save the day. Some of them have the best intentions, but it can be taken out of their hands if we stop the craziness and find a better way. Is it really so hard not to hit students in school as a form of punishment? Would there really be educators that are devastated they can no longer wail away on students for being bad? If there are some, they need to be gone right away. While figuring out how to discipline students is never an easy thing and our practices have evolved over the years, we need to make sure that discipline is equatable across the board. As educators, we need to be better in different ways to help support our students. We all have different approaches to ensure the success of our students. I would truly hope we could all agree that we need to stop hitting them in schools. I've been playing with my own Arduinos for a few months and have come up with fun projects based on sketches I've found online and books I've purchased. I've even designed my own case to hold my Arduino while I built projects around it. I am always looking around for new ideas and I really wanted to find something different that would really allow me to explore using Arduino in many different ways and also be able to show students how it can be used. Luckily I was able to find a very cool piece of technology on Amazon that looked amazing! 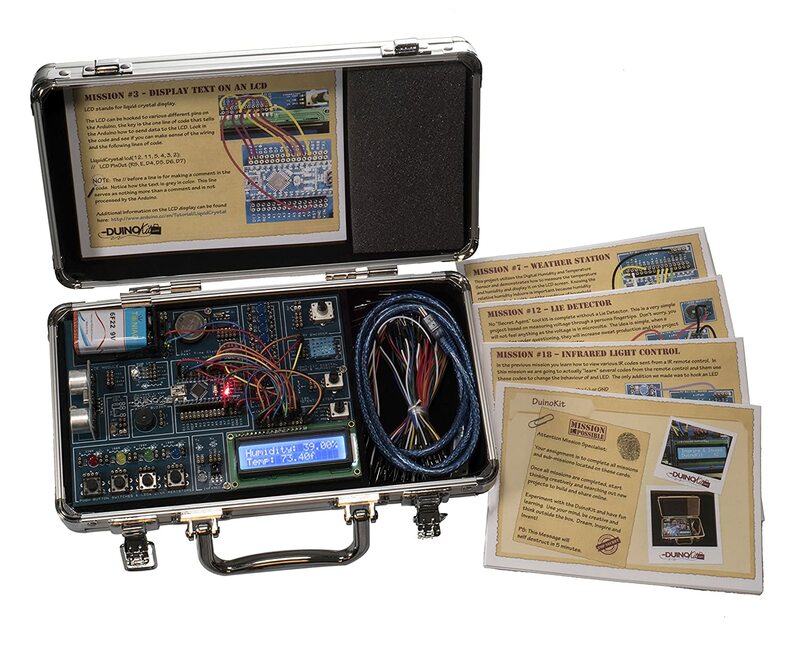 The DuinoKit is an all-in-one Arduino Discovery Kit. It has all of the parts you would need to try new things with your Arduino. It is set up with an Arduino Nano and everything is all wired together in the briefcase. All the user has to do is attach the wires to the specific parts and run the code. Here are a couple of examples that I have been able to put together. Programmed the CDS Cell (light sensitive) to cause the led to blink faster in the dark. Pushing the button turns it off. Coded it all by myself. #MakerEd #Making #Arduino Check out www.DuinoKit.com if you want to check this kit or the Jr Kit out. Here is a simple connection and code that showed me the temperature and the humidity in my classroom. Just connected a few wires and ran the code. The students that came in the room that is was very cool. I took some deep breaths and blew on the sensor and watched as the humidity and temperature increased on the LCD screen. Again, it was very cool. I had some questions about connecting certain parts, so I emailed the support address and got a response immediately. After exchanging a few emails, it turned out that DruinoKit is run by a Math Teacher. He teaches during the day and fills orders as they come in. I honestly thought that this was a large company that was putting together this high quality product. This fact makes me love DruinoKit even more. I love supporting teachers that going the extra mile to help learning beyond their own classroom. There are two kits that you could purchase. I bought the Essentials Kit and love it. There is a Duino Kit Jr. that is also worth exploring. You can see that the Jr Kit comes with these really cool Mission cards. I was able to get these from the DruinoKit website to use with my Essentials Kit. You have to change some of the wire connections for the Missions to work, but I was told that there will be some new Missions coming up shortly and a revamped Forum that will allow for more sharing of the different projects people are creating. Of all of the money I have spent over the past few months, this is some of the best money I have spent. I look forward to taking my Essentials Kit with me as I travel this Summer and talk about Makerspaces with educators. When it is all said and done, I highly recommend educators buying a kit if they are looking for ways to enhance their own understanding of coding and Arduino and for something awesome to add to their Makerspace that supports a teachers. If you have any questions about this kit, please reach out and I'm happy to tell you how awesome it is again. I've been playing with Raspberry Pi and Arduino for a few months now. I've had a great experience looking at what others have done and copying their code to make things blink or move. I've had a blast seeing how younger students can learn to code using Scratch. I made this guy move around playing with the program and I felt very accomplished when I was done. I learned how to do it using Kano. I will have a more detailed post in the coming weeks as I play with it more, bit I can say that I totally love it and see why kids around the world are signing up and learning to code using this wonderful piece of technology. I wrote my own code and made 4 different lights blink on and off and repeat. I was able to make them speed up and slow down and I understood why. I am so excited and proud of what I was able to learn on my own. I've run the code and programmed my Arduino to take the humidity and temperature of my room and display it on the LCD. I've been learning on my DuinoKit. I picked it up online and love it. Check it out at DuinoKit.com. I will have a more in depth post soon, but I wanted to recognize the tool that really helped me learn. The reason I have been doing all of this is that I like to keep busy and learn new things. This technology is more accessible than ever. Growing up in the 80s and 90s, I never thought I would be able to build my own computer, 3D design a case, and run programs that I wrote. Heck, watching the movie WarGames made me a little worried that I would start Global Thermonuclear War by accident if I typed in the wrong code. Now, I have access to these tools and I want to learn them so I can share them with students and my son. I do not want Leo to be left behind because I chose not to engage in emerging technologies. I encourage all of you out there to pick up something small and practice so you will feel comfortable sharing with your students. Today, students were given their schedule forms to consider classes for the next school year. It seems early, but planning a schedule for 1700 students takes time. As teachers, it is our job to tell the students about the classes available and guide them to the correct choice. It's a fairly simple process, but it is one that could easily be glossed over in favor of instruction. During my prep period, I had to run around the building for various reasons and I saw something that just made me smile and reinforced my belief that I teach with the best staff in the world. I saw teachers in the hallway and in their classrooms sitting with students and discussing their educational options moving forward. Teachers were giving their students the individual attention they needed to help them make the best choice for the next year. These are classes of close to 30 students at times, so to give the students individual attention can be tough. It did not seem to phase these teachers though. They had their forms our and were ready to have a frank discussion with the students. I'm sure this happens in other schools, but it was so awesome to see all of these teachers working on the same thing with all of these different students. This personalized attention is key to helping students achieve the success they are capable. Those small conversations can be a difference maker for our students. I think it is something that we should all try to remember. I spent time this weekend with some amazing educators from across the country. ECET2 was a great experience. I walked away with many different ideas I look forward bringing to my classroom and school. There was something that struck me while I was in the edcamp session. The session was cool and set up mini sessions at tables. I was with Meenoo Rami, Pernille Ripp, and Ann Leaness. We thought it would be a good idea to do a session on literacy. I'm always looking for ways to encourage students to read and improve reading skills for all of my students. I asked one questions that led to a conversation filled with resources and great ideas, "What can I do to get my male students to read more?" As I sat there listening to all of the great ideas that were being shared by teachers, I was struck at how long it took me to ask this question. I'm friends with some of the most amazing educators in the world who work hard on sharing literacy strategies. These are people I talk to on a regular basis. We chat education and anything else that comes to mind. Yet, with these amazing experts surrounding me, I never once thought about asking them for help. It really made me think about why. It is so tough to admit not knowing something. It's tough to admit that there are things that I can be better at. It's tough to admit to yourself, much less put it out there on the Internet when you need support. As I work to be a better teacher in so many other ways, it can be tough to admit areas where I still need to grow. I find it weird that there are some things I choose to ask for help with and others I will keep hidden. Maybe it has to do with the fact that I'm an English teacher and I'm afraid to admit a weakness is that field, but non-English areas I feel it's acceptable to ask for support. It has given me something to think about. As I look inward and figure all of this out, I hope to become better at asking for help from others.